Two years ago, the Tianqiao and Chrissy Chen Institute partnered with Caltech to launch a major neuroscience initiative. Central to the initiative was the creation of the Tianqiao and Chrissy Chen Institute for Neuroscience at Caltech, where research investigations span a continuum, from deciphering the basic biology of the brain to understanding sensation, perception, cognition, and human behavior, with the goal of making transformational advances that will inform new scientific tools and medical treatments. Construction on the Chen Neuroscience Research Building began in March 2018 and is expected to be completed by October 2020. Construction of the building had to be carefully scheduled around lamprey breeding season. The laboratory of Marianne Bronner [Albert Billings Ruddock Professor of Biology] uses the jawless fish for studying developmental biology, and any vibrations caused by construction could have disrupted their summer breeding. To accommodate the building's basement and sub-basement, 67,000 cubic yards of dirt were excavated from the site. The building will house labs and offices for more than a dozen principal investigators. The floors in the Chen building are aligned with the floors in the Broad building to the south, facilitating a subterranean tunnel connection between the two buildings. Chen construction required the removal of several existing facilities, including the Wilson Court bungalows, originally located at the southeast corner of Wilson Avenue and Del Mar Boulevard. In recognition of Pasadena's architectural heritage, Caltech elected to preserve the 1920s-era bungalows—and their historically significant configuration—rather than demolish them. The seven bungalows have been moved to the northeast corner of Catalina Avenue and San Pasqual Street and will serve as campus housing once renovations are complete in May of 2019. A rendering of the Chen Neuroscience Research Building. Credit: Smith Group A rendering of the interior of the Chen Neuroscience Research Building. Credit: Smith Group Two years ago, the Tianqiao and Chrissy Chen Institute partnered with Caltech to launch a major neuroscience initiative. Construction on the Chen Neuroscience Research Building began in March 2018 and is expected to be completed by October 2020. 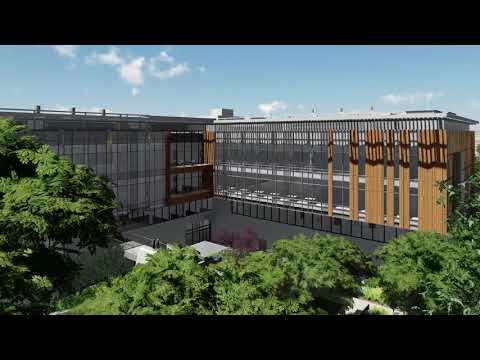 This fly-through animation provides a sneak peak at the incredible new building. A rendering of the Chen Neuroscience Research Building. A rendering of the interior of the Chen Neuroscience Research Building.